Isabella I of Spain (April 22, 1451—Nov. 26, 1504) was queen of Castile and León in her own right and, through marriage, became queen of Aragon. She married Ferdinand II of Aragon, bringing the kingdoms together into what became Spain under the rule of her grandson, Charles V, the Holy Roman Emperor. She sponsored Columbus' voyages to the Americas and was known as Isabel la Catolica, or Isabella the Catholic, for her role in "purifying" the Roman Catholic faith by expelling Jews from her lands and defeating the Moors. At her birth on April 22, 1451, Isabella was second in the line of succession to her father, King John II of Castile, following her older half-brother, Henry. She became third in line when her brother Alfonso was born in 1453. Her mother was Isabella of Portugal, whose father was a son of King John I of Portugal and whose mother was a granddaughter of the same king. Her father's father was Henry III of Castile, and his mother was Catherine of Lancaster, the daughter of John of Gaunt (third son of England's Edward III) and John's second wife, the Infanta Constance of Castile. Isabella's half-brother became Henry IV, king of Castile, when their father, John II, died in 1454, when Isabella was 3. Isabella was raised by her mother until 1457, when the two children were brought to court by Henry to keep them from being used by opposition nobles. Isabella was well educated. Her tutors included Beatriz Galindo, a professor at the University at Salamanca in philosophy, rhetoric, and medicine. Henry's first marriage ended in divorce, without children. 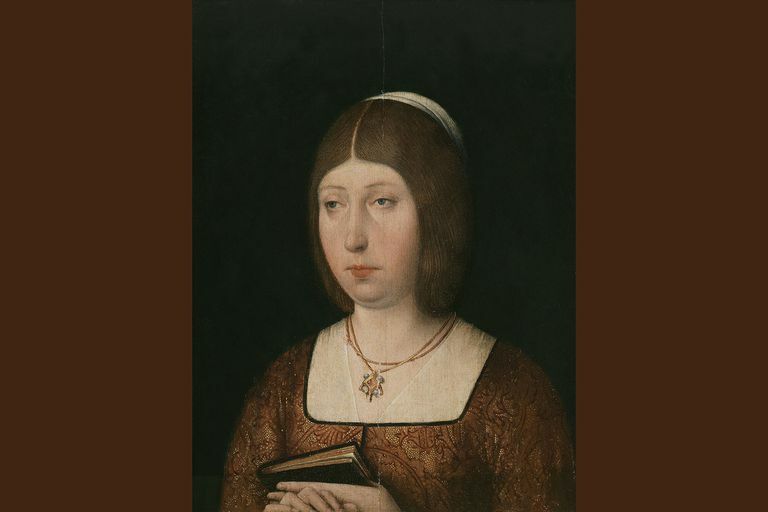 When his second wife, Joan of Portugal, bore a daughter, Juana, in 1462, the opposition nobles claimed that Juana was the daughter of Beltran de la Cueva, duke of Albuquerque. Thus, she's known in history as Juana la Beltraneja. The opposition's attempt to replace Henry with Alfonso failed, the final defeat coming in July 1468 when Alfonso died of suspected poisoning, though historians consider it more likely he succumbed to the plague. He had named Isabella his successor. Isabella was offered the crown by the nobles, but she refused, probably because she didn't believe that she could maintain that claim in opposition to Henry. Henry was willing to compromise with the nobles and accept Isabella as his heiress. Isabella married Ferdinand of Aragon, a second cousin, in October 1469 without Henry's approval. The cardinal of Valentia, Rodrigo Borgia (later Pope Alexander VI), helped Isabel and Ferdinand obtain the necessary papal dispensation, but the couple still had to resort to pretenses and disguises to carry out the ceremony in Valladolid. Henry withdrew his recognition and named Juana as his heir. At Henry's death in 1474, a war of succession ensued, with Alfonso V of Portugal, prospective husband of Isabella's rival Juana, supporting Juana's claims. The dispute was settled in 1479 with Isabella recognized as Queen of Castile. Ferdinand by this time had become King of Aragon, and the two ruled both realms with equal authority, unifying Spain. Among their first acts were various reforms to reduce the power of the nobility and increase the power of the crown. After her marriage, Isabella appointed Galindo as tutor to her children. Galindo founded hospitals and schools in Spain, including the Hospital of the Holy Cross in Madrid, and probably served as adviser to Isabella after she became queen. In 1480, Isabella and Ferdinand instituted the Inquisition in Spain, one of many changes to the role of the church instituted by the monarchs. The Inquisition was aimed mostly at Jews and Muslims who had overtly converted to Christianity but were thought to be practicing their faiths secretly. They were seen as heretics who rejected Roman Catholic orthodoxy. Ferdinand and Isabella were given the title "the Catholic monarchs" by Pope Alexander VI in recognition of their role in "purifying" the faith. Among Isabella's other religious pursuits, she took a special interest in the Poor Clares. an order of nuns. Isabella and Ferdinand planned to unify all of Spain by continuing a long-standing but stalled effort to expel the Moors, Muslims who held parts of Spain. In 1492, the Muslim Kingdom of Granada fell to Isabella and Ferdinand, thus completing the Reconquista. That same year, Isabella and Ferdinand issued an edict expelling all Jews in Spain who refused to convert to Christianity. Also in 1492, Christopher Columbus convinced Isabella to sponsor his first voyage of exploration. By the traditions of the time, when Columbus was the first European to encounter lands in the New World, these lands were given to Castile. Isabella took a special interest in the Native Americans of the new lands. When some were brought back to Spain as slaves, she insisted they be returned and freed, and her will expressed her wish that the "Indians" be treate with justice and fairness. By her death on Nov. 26, 1504, Isabella's sons and grandsons and her older daughter Isabella, queen of Portugal, had already died, leaving as Isabella's only heir "Mad Joan," Juana, who became queen of Castile in 1504 and of Aragon in 1516. Isabella was a patron of scholars and artists, establishing educational institutions and building a large collection of artwork. She learned Latin as an adult and was widely read, and she educated her daughters as well as her sons. The youngest daughter, Catherine of Aragon, became the first wife of Henry VIII of England and mother of Mary I of England. Isabella's will, the only writing that she left, summarizes what she thought were her reign's achievements as well as her wishes for the future. In 1958, the Roman Catholic church began the process to canonize Isabella. After an exhaustive investigation, the commission appointed by the church determined that she had a "reputation of sanctity" and was inspired by Christian values. In 1974 she was recognized with the title "Servant of God" by the Vatican, a step in the process of canonization. "Isabella I: Queen of Spain." https://www.britannica.com/biography/Isabella-I-queen-of-Spain.